Sloopin is proud to work with The Anti-Cruelty Society and the PetSmart Charities Everyday Adoption Center (EAC) in the South Loop (1101 S. Canal) to help bring awareness to their adoption program. Every month we will be posting about a local animal who could use a home. 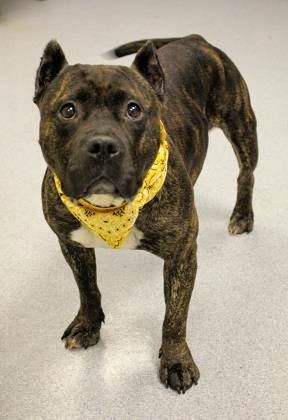 Say hello to Bre, a 4-year-old pit bull mix who is available for adoption through The Anti-Cruelty Society. Bre is a social, friendly girl, whose tail is always wagging! She can be a little nervous coming through thresholds and approaching stairs, but will come forward with gentle encouragement. Bre should adjust well to most households and will make a great companion for a variety of families. Come meet this sweet, soft girl today at the PetSmart Charities Everyday Adoption Center located in the South Loop PetSmart. The Anti-Cruelty Society, Chicago’s oldest and largest animal welfare organization, opened up the South Loop satellite location in 2013! So far they have adopted close to an impressive 1,000 cat, dogs, puppies and kittens. The EAC has room for 42 dogs, cats, puppies and kittens. The 2,075 square foot facility includes kennels for dogs of all sizes, a cat adoption center, play areas for dogs waiting to find a home and an area for adopters and pets to hold meet-and-greets. More info on the EAC and the animals available can be found here.